19. How can I save on my flight? 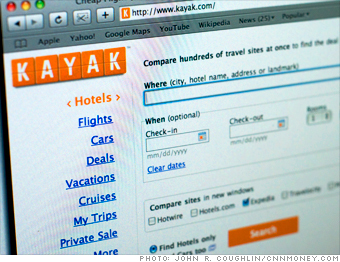 If you go to only one travel search site, make it Kayak. It ropes in not just the deals offered at such big online travel agents as Orbitz and Expedia but also those from dozens of other travel sites and airlines that many tools miss. A recent search for a spring flight from New York to Lima, for example, turned up one on Copa Airlines' site that cost $30 less than the same flight on Orbitz. Coolest feature: Kayak shares the deals its users have found on your route. If you can adjust your itinerary to match their dates, you may score the cheaper fare. Try this too: Yapta.com will track the price of your flight and e-mail you if it drops enough that rebooking makes sense, even with penalty fees. NEXT: 20. Should I give to this charity?